The Xoximilco tour recreates one of the most deeply rooted traditions in Mexico and gives you a new way to celebrate your stay in Cancun. You’ll have the chance to tour beautiful canals and admire the sunsets in this renowned Caribbean tourist destination. You’ll board a boat decorated with motifs from the 32 Mexican states and travel through canals that are four and a half miles in length. A guide will accompany you and tell you about traditional country legends that will liven up the evening. 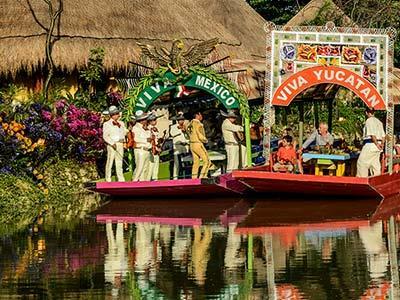 During the ride you’ll be able to savor rich Mexican entrees and drinks as you listen to the sounds of the marimba and mariachi. If you and your companions wish, you can even accompany the musicians. Join this tour and experience a true celebration of joy and folklore!